Starting GPS Co-ordinates: N51 13' 90" W000 72' 00"
Finishing GPS Co-ordinates: N51 14' 00" W000 73' 00"
NB as of 13/07/14 this byway has been cleared the fallen tree which blocked it. Enjoy. This is an absolutely fantastic, if technical, greenlane. Starting from the eastern end, the byway begins by leaving the metalled lane of the same name by a large cottage and immediately plunges down a very steep decline. Care must certainly be taken here as the sandy surface is firm in dry weather but it is also a little rutted and as such the descent is a little trickier than it would otherwise be. Encroaching foliage is seldom a problem. On fording the ghyll, the lane heads ever-more-sharply uphill and winds around the hill on to a more westerly track, ending eventually on the hard surface of the driveway of Ridgeway Farm. A great lane, if a little short, and it is certainly a challenge! 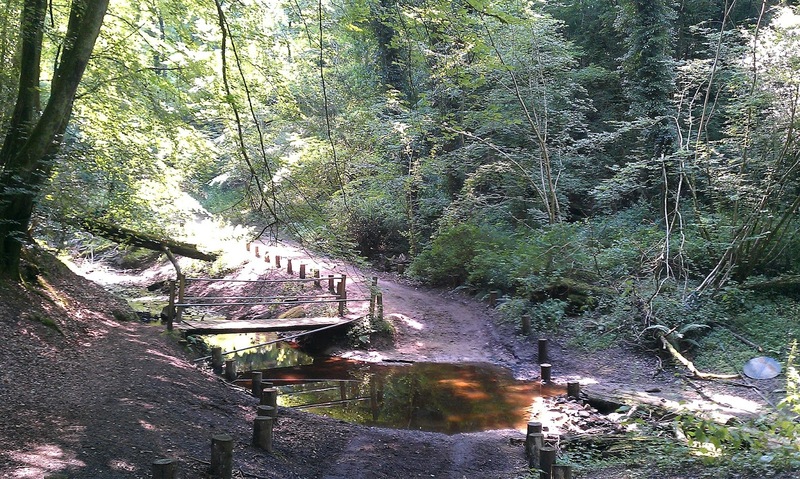 This byway is also featured in Land Rover Owner International magazine's November 2012 issue as byway number 1. 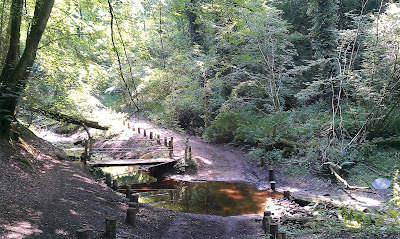 It has also been called Ridgeway Farm Road and Hyde Lane, as well as BOAT 92A by Surrey County Council. Ran west to east 27/12/2013. Love the eastern entrance/exit hill. Very good lane but the small stream in the photo had been bigger overnight and carved out the bank into a small 1-2 foot step. The steering guard took a bit of a bash as I went up it. I'm sure it will return to normal with time, but something to be aware of (I'd guess if you go east to west, a towing hitch would catch on the same step). Tried this 09/02/2014 from the East, but met a group of bikers come out who assured me it was blocked with a big tree and needs a bit of chainsaw attention to make it passable again. Thanks for the invaluable feedback, people! This post has been updated with your information. We're more than happy to help! Although we don't know if it's been cleared yet. I shall ask the Twittersphere. Thanks so much for the update, dudes. That one was invaluable. This byway is now clear so fill your boots people!